Is HEM Ankle Rehab a Scam? I have seen a number of posts on the internet asking, “Is HEM Ankle Rehab a scam?” I do not take it personally and fully understand that most people are skeptical by nature. Believe me, I am too! So, let me address people’s concerns and explain why HEM Ankle Rehab is the real deal. Let me begin by telling you who I am. My name is Scott Malin and I am the creator of the HEM Ankle Rehab System. I was certified by the National Academy of Sports Science (the most prestigious certification for personal trainers in the United States). Over the years, I have trained a number of high profile celebrities and athletes and continue to do so on a regular basis. I have been featured on ABC and KTLA News as a fitness expert, multiple times. My exercise videos on You Tube have OVER 7 million views to date. I have written a total of 7 best selling books on fitness and nutrition. 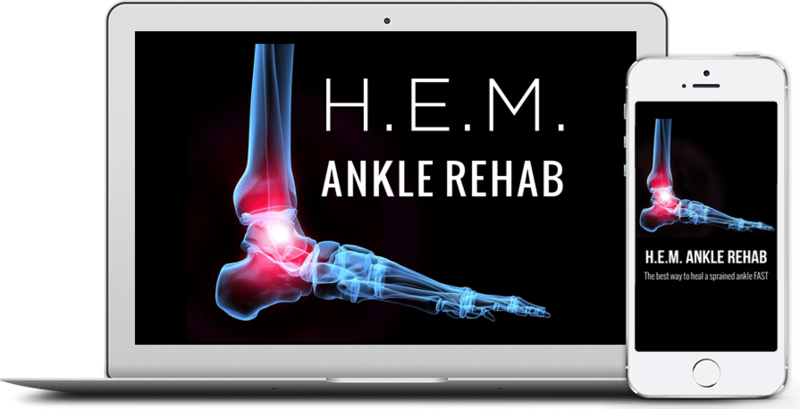 I created the HEM Ankle rehab System many years ago, because I play a lot of basketball and sprained my own ankles countless times. Like you, I used to waste a lot of time resting and icing my ankle. I tried all kinds of ankle braces and basketball shoes, but nothing reduced my risk of more ankle sprains. And every time I sprained my ankle again, it would take longer and longer to heal. And the worst part was that my ankles were getting weaker and negatively affecting my performance. Eventually, I got totally fed up and decided to use my own knowledge and expertise to find a better way. So, I started doing a lot of research and speaking to other experts in the fields of strength, conditioning and coaching. As time went on, I discovered that the outdated method of R.I.C.E. (rest, ice, compression, and elevation) was used simply out of necessity decades ago, but experts now acknowledge that it is totally useless for healing ankle sprains. By continuing to experiment and research the subject for another year, I worked out a simple 3 step system to heal a sprained ankle that flew in the face of conventional wisdom. I kept honing the healing techniques until I came upon the best three of all of them… Of course, I was the original guinea pig, but once I saw the significant reduction in healing time and improved strength and stability in my ankles, I knew I was onto something. Then, I started using it on my own clients and they got the same results, so I knew I had discovered something very useful. With this new system, I was able to reduce the average healing time of 4-8 weeks to 3-7 days. And instead of weak, unstable ankles, people had strong, stable and mobile ankles which put them at a much lower risk of re-injury. Some more time went by, and after some prodding by a number of people, I decided to turn the system into a book, so I could help thousands of other people heal a sprained ankle quickly and effectively on their own. Eventually, I did the step by step videos to make it even easier for people to understand and follow the steps of the system. And nothing makes me happier than reading all of the stories from people all over the world that HEM Ankle Rehab has helped. 1) You can rest and ice and wait for your ankle to try and heal itself. This has been repeatedly and convincingly shown in research to be a total failure and set you up for long bouts of ankle pain, weakness, instability and re-injury. 2) You can go see a Physical Therapist (make sure it is a good, accredited therapist) who will help guide you through the healing process (this is great, but can be expensive). 3) You can use the healthy and safe rehab techniques in H.E.M. to quickly and effectively heal your ankle at home. By the way, I offer a no hassle 30 day money back guarantee, no questions asked. Whatever you do, instead of just dismissing it as a scam, I hope you I hope you will take a little time and learn more about the HEM Ankle Rehab System, so you can be informed and make the best decision for yourself or a loved one. One last thing, please check out the reviews and stories from real people like you who have seen a huge positive difference in healing a sprained ankle with H.E.M.